At the Fence: Neater Feeder! A Neater Way to Feed Your Pets! Fall is definitely in the air, and we are spending way more time outside both playing games and just enjoying the weather. This of course includes our wonderful dogs! I wanted to take some time and share with you the Neater Feeder. Now, I don't know how it is in your home, but we keep a water dish and food bowl in the kitchen. This is so Pansy and Grace can help themselves whenever they like. The younger two do not get this benefit as they are crated at night, because they still have accidents and of course they need to learn what they can and can't chew on! Well, I don't know how many times someone in the family has accidentally kicked one of the dishes. Either food goes flying everywhere or water slowly moves across my floor. (Our home is older and the floor slants, so it doesn't just puddle, it runs!) And of course depending on who kicked it, sometimes it is not completely cleaned up. You end up slipping in water, or stepping on a piece of dog food on a tile floor. Ouch! I have tried moving it to different locations hoping it would cut down on the spills, but this just has not worked. Now, I have a solution. It is called Neater Feeder. This is such a great idea. The Neater Feeder comes with two metal removable bowls that sit in a tray on a base. The tray has holes that allow spilled liquid to drain into the base. Any spilled food is caught in the tray and can be easily cleaned up. I also like that it is raised off the floor, and also comes with leg attachments so you can raise it a little more if you dog needs it up higher. I am sold! Be sure to watch the video my daughter made. She had so much fun designing it for me. Grace and Pansy both approve the Neater Feeder. 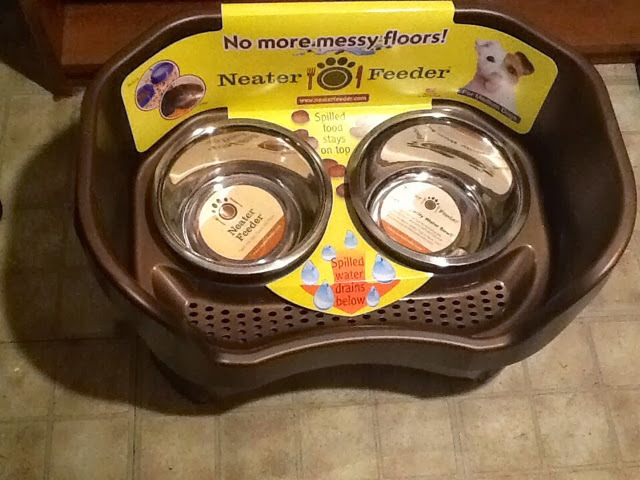 So if you are looking for a neater way to feed your pets, check out the Neater Feeder website. I am sold on this feeder. The Neater Feeder comes in three sizes, small, medium and large. It is also available in...I hate to even say it...sizes for cats. Just kidding, we have a cat too! You can choose from cranberry or bronze. The medium Neater Feeder ranges in price from $49.99- $53.98 plus shipping. The Neater Feeder has won several awards. One neighbor will receive a Neater Feeder of their own, so be sure to enter! I have a Bichon Frise. I would really love this!! I have two black labs and would need the large size. We have a pit bull & siberian husky mix. A medium size is what we would want. I have a granddog who is part Heinz 57 and part loveable, and he would love a Bronze Neater Feeder, but my cats would love the Bronze cat feeder.. I have a Shih Tzu! I'd probably get a medium! I would choose the large size because we have a big boxer mix dog named Tank! My furbaby is a Westie and the small would do just fine! Thanks! We have eight dogs, including three rescues who would absolutely love to have a neater feeder! The rescues are a sheltie, a long hair chihuahua and a pit bull and the others are shelties also. The pit bull is an amazing protective big brother to all the little dogs, but he is also the worlds messiest drinker. Between him making a huge mess when he drinks and the water bowls being kicked, I'm constantly wiping up water off my kitchen floor. 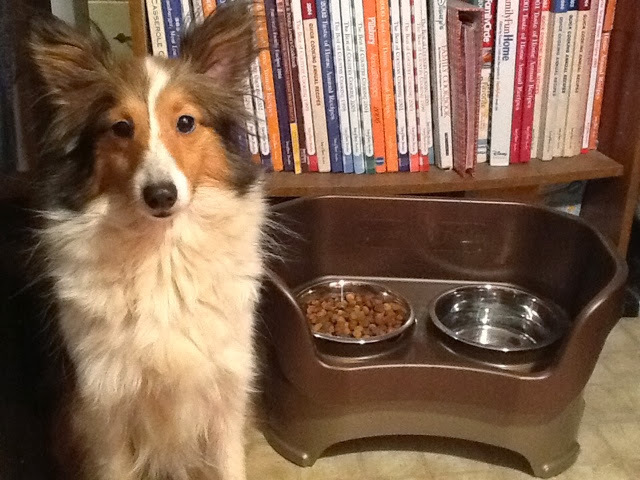 A couple of my shelties are not much better as they have a silly habit of licking up the side of the water bowl which results in water dribbling over the side of the bowl. This neater feeder would be perfect for my dogs and would save me from having to constantly wipe up spilled water on the kitchen floor! Thanks for the chance to win! Oops, forgot to say me and my fur kids would prefer a large size neater feeder as that size would suit all the dogs and the shorter ones prefer a taller water bowl too! Thanks again for the chance to win this for my dogs! We have a Scottie. I think a medium is going to be the right size for her. My family's little furbaby member is a mini-dachshund! She would need the small size! My family's little furbaby member is a mini dachshund. She would need a small size! We have a mini dachshund and the small one would fit her just fine. We have two dogs Sugar a Rat Terrier mix and Cinnamon a Sheltie/Beagle mix. I would choose at least a medium sized one. We have a Chocolate Lab but my daughter is getting a Corgi so maybe the medium size. I have a Dobie mix pup named Froggie. I think the Large Neater Feeder would be perfect for her. for cats with a 6"+ shoulder height in cranberry. I don't hav ea dog yet, but I have cats and could really use the cat sized one. I shared this fantastic giveaway on Google +. I have a chocolate lab, so I'd need the large. We have two yellow labs and we would definitely need the size large. My dog is large so I would get the largest size.